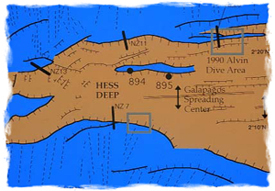 Sketch map of the Hess Deep rift. The darkness of a Grand Canyon-sized underwater chasm will soon draw Nicholas School of the Environment earth scientists and their students to the Pacific Ocean off Ecuador to learn more about how new oceanic crust forms along Earth's 37,000-mile mid-ocean ridge network, which belts the planet like the seams of a baseball. Led by Jeffrey Karson, Professor and chairman of the Division of Earth & Ocean Sciences, the National Science Foundation-funded expedition will travel southwest from Manzanillo, Mexico, on March 12 aboard the Woods Hole Oceonographic Institution research vessel R/V Atlantis to visit a place where the edge of one such ridge has been cross cut by a plunging rift known as Hess Deep. Named for Harry Hess, the father of the hypothesis that new crust gets created through seafloor spreading along mid-ocean ridges, Hess Deep is "a unique kind of thing," says Associate Professor Emily Klein, a co-principal investigator on the mission. 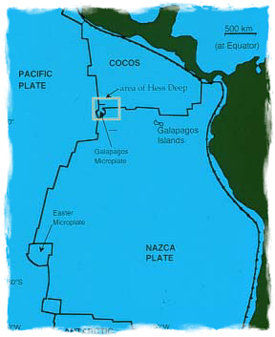 Formed by the separation of two huge plates � the Cocos and the Nazca � that make up part of the ocean floor just west of Central and South America, the upper rim of Hess Deep is located a full mile underwater. The rift plunges as deep as 9,000 more feet at its lowest spot. Hess Deep is especially valuable to science because it slices through a slowly-moving treadmill of recently created crust produced at one of the planet's fastest-spreading mid ocean ridges, the East Pacific Rise. The rift exposes spots where lava upwelled only in the last million years � a mere heartbeat on the geological time scale � and was then pushed away from its point of origin, which is what newly formed crust seems to do. Pillow lavas on the sea floor. What scientists who visit the site will see is frozen cross sectional records of past eruption events, displayed one after another on the walls of Hess Deep like cutout paper dolls. These complex structures, which demand the utmost in geological knowledge and observational ability to interpret, are normally buried underneath the sea floor. Hess Deep, then, provides a crucial window into one of Earth's important geological processes: how it makes new skin. "It's like taking a knife to a layer cake," adds Klein, who � like Karson � has had plenty of previous experience at deep underwater geology. "It allows you to look at the base of that layer cake, which is very unique." According to the hypothesis Hess outlined, molten magma of basaltic materials constantly upwells along the crests of these mid-ocean ridges. As that outpouring reaches the surface as lava, it gets pushed away from the ridge flanks and spreads out as new oceanic crust. At the same time, older crust located at the far edges of oceanic plates gets remelted and recycled after being forced underneath continental masses. That's now happening where the Cocos plate dives underneath Central America and the Nazca under South America. in the equatorial Pacific Ocean. 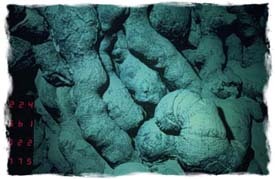 While a variety of evidence supports the general sea floor spreading hypothesis, a host of details are far from resolved, and that is the reason for geological expeditions like Hess Deep. "The main objective for us is to document what the internal structure of the uppermost oceanic crust looks like," says Karson, who will serve as chief scientist. "We know that its covered with this frosting of basalt, but what's underneath that?" Karson wonders, for example, how episodic the eruptions of lavas are? Do active phases get followed by quiet periods during which the underlying magma chamber deflates like a spent balloon? And he wonders exactly where all that newly created magma goes after it is released from the crests of the modest-sized mid-ocean ridges and then begins to cool? "We don't build up a giant mountain of material," he says. "We don't have a big hole to fill, either. The obvious answer is we have to keep dropping the bottom out underneath, and keep filling it in. "But how do you get that material out of the way? Does it subside along faults or fractures at the edges of dikes? Does it collapse in a chaotic way like a pile of gravel, or does it flow out of the way in a more uniform fashion? Dikes, among the geological structures that the Hess deep researchers will be examining, are the now-solidified pipes through which molten minerals from deep within the earth, called magma, traveled to the surface in the past. "The details of that internal structure are essential for us if we want to understand what is going on immediately underneath that ridge axis when the oceanic crust is created." To attempt to answer questions like these, Duke's expedition will concentrate only on the upper 6,000 feet of the north wall of Hess Deep, high enough to expose interesting rock strata that would degenerate into rubble fields further down the slope. During its 24 days floating over the Hess Deep study site � from March 16 to April 8 � the Duke team will be able to call on three sophisticated Woods Hole-provided devices, each riding when unused aboard R/V Atlantis. The first task will be two days of explorations with the DSL 120 side scan sonar system, a 10.8-foot long towed underwater vehicle that will broadcast 120 kilohertz sound waves off Hess Deep's wall. With suitable electronic processing, the returning sonar beams will paint shadowy, black and white mosaic portraits of the underlying geology, based on the degree to which particular kinds of rocks absorb or reflect sound. Next will come "something that has never been done before in this sort of place," says Karson. The Duke researchers will spend four days, and perhaps some additional nights, photographing some of what the DSL 120 "sees" with Argo II, a 15-foot-long underwater sled that is festooned with cameras and bright lights. Argo II will move slowly over interesting areas while adjusting its position with thrusters, but will remain linked to the ship by a cable that also provides fiberoptic communications. As its operators maneuver it from back aboard Atlantis, it will make thousands of images that can later be merged with computers to form high-resolution "mosaics." Alvin on the sea floor. That will be followed by 16 days of dives to Hess Deep aboard Woods Hole's manned submarine, the titanium hulled Alvin, a 23-foot long craft capable of carrying two researchers at a time to depths as low as 14,764 feet and remaining submerged for as long as 10 hours. 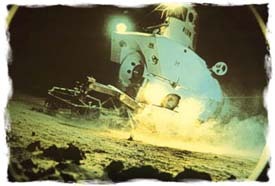 Alvin comes equipped with video cameras and a 35-millimeter camera, as well as with mechanical arms that can break off geological samples to return to the surface for geological analysis. Even more important, its viewing ports will give scientists the opportunity to personally view the details of the rock face. "The most important thing scientists can do is describe what they see out the window," says Karson. "You're looking out the window, constantly talking into a tape recorder about what you're seeing, for six hours at a time," adds Klein. Each Alvin dive will include at least one senior scientist, a flexibility that will also allow students on the voyage to make forays to the bottom and record their impressions. And after those students resurface, "they will be absolutely buried in trying to write up the results of that dive," Karson says. "We require that everybody sit down and produce a complete written transcript of the voice log they record." They will also have to integrate the taped comments with the photographic and videotaped records so that "we really have a detailed report on each dive before those people dive again." Meanwhile, other students will be engaged in the dirty but essential task of "cutting rock samples and cataloguing them," he adds. "Everybody out there is going to be working flat out for the whole time." Except when they are diving in the Alvin, students and scientists will live and work on the R/V Atlantis, a 274-foot long state-of-the-art oceanographic research vessel built in 1997. Completely air conditioned � important at Hess Deep's sultry equatorial latitude � it features sleeping and working space for 24 researchers, including 3,710 square feet of laboratory space. There is also a library/lounge, a washer and dryer (especially important for students cleaning rock samples), and telephone, e-mail and fax links with the outside world.